Many people planning a bathroom renovation focus on choosing a beautiful bathroom vanity, bathtub or faucet for their project before choosing a toilet. However, experts say choosing the right toilet can be one of the most important decisions homeowners will make. According to the U.S. Environmental Protection Agency (EPA), toilets are the main source of water use in the home, accounting for nearly 30 percent of residential indoor water consumption. Those renovating a bathroom or who simply want to do something in their existing bathroom to help conserve water should consider installing a new toilet, as replacing an older model with a WaterSense-certified toilet can save as much as 4,000 gallons of water each year. The fact that these toilets use less water doesn't impact their performance. Other considerations individuals looking for a new toilet may have to think about include oval versus elongated bowls, single versus dual-flush models and gravity versus pressure-assisted toilets. Budget is also a major consideration for many. 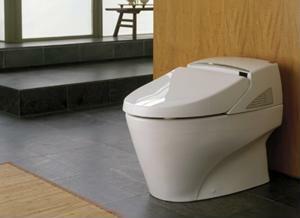 Experts say one-piece toilets are often easier to clean but can be more expensive and harder to install. Others may want to think about purchasing a toilet with a lined (insulated) tank, to help prevent condensation - or "sweating" - during the summer. Programmable showers: The wave of the future?